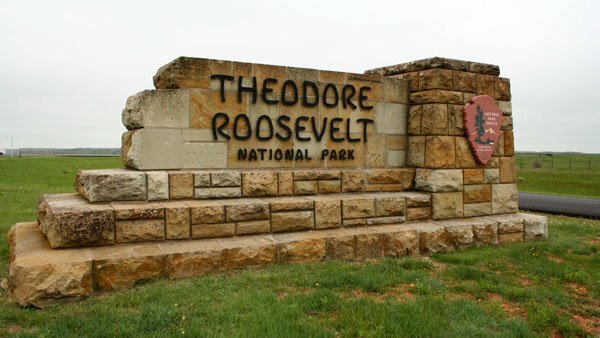 Welcome to the Theodore Roosevelt National Park Information Page. Theodore Roosevelt National Park is located in westcentral North Dakota. The park is separated into north and south units. The North Unit is near Watford City, ND and South Unit is near Medora, ND. The remote Elkhorn Ranch site is between the two units along the Little Missouri River. The closest major airport is Bismark, North Dakota, there are smaller airports at Dickinson & Williston, ND. 1. Take Highway 85 South to the North Unit of the park. 2. Take Highway 85 South to I-94 West and the South Unit of the park. 1. Take I-94 West to the South Unit of the park. 2. Take I-94 West to Highway 85 North to the North Unit of the park. 1. Take I-29 North to I-94 West to the South Unit of the park. 2. Take I-29 North to I-94 West to Highway 85 North to the North Unit of the park. 1. Take I-94 East to the South Unit of the park. 2. Take I-94 East to Highway 85 North to the North Unit of the park. The North and South units are in western North Dakota. The North Unit Visitor Center is located 16 miles south of Watford City along Highway 85. The South Unit Visitor Center is located in Medora, just off I-94 and is 135 miles west of Bismarck, North Dakota. The Painted Canyon Visitor Center is located seven miles east of Medora just off I-94. The distance between Medora at the South Unit and the visitor center in the North Unit is 70 miles via I-94 and Highway 85. Passenger vehicle is the main mode of transportation. Air service into North Dakota towns of Bismarck, Dickinson and Williston. Bus transportation along I-94. Train service into Williston, North Dakota. Personal vehicles, bicycles and charter bus. On 10 November 1978, Theodore Roosevelt National Park was given national park status when President Carter signed Public Law 95-625 that changed the memorial park to Theodore Roosevelt National Park. This same law placed 29,920 acres of the park under the National Wilderness Preservation System. Visitation is highest in June, July and August. Visitation is increasing during the shoulder seasons of May and September. Lowest visitation is November to February. Today, the colorful North Dakota badlands provides the scenic backdrop to the park which memorializes the 26th president for his enduring contributions to the conservation of our nation’s resources. The area was first established as a Memorial Park in 1947. It gained National Park status in 1978. The Little Missouri River has shaped this 70,448-acre park which is home to a variety of plants and animals. All visitor centers, wayside exhibits, campground amphitheaters, Maltese Cross Cabin are accessible. Both campgrounds have accessible campsites. First portion of Little Mo Nature Trail is paved. Parking areas at each visitor center for buses and trailers. Pull-outs along park road accommodate longer vehicles. Orientation film shown at Painted Canyon and North Unit visitor centers can be captioned. Printed text is available at the South Unit Visitor Center. Access to the Elkhorn Ranch site may require 4-wheel drive and may be inaccessible at certain times of the year due to weather and road conditions. Theodore Roosevelt National Park is noted for opportunities to see bison, elk, mule and white-tailed deer, pronghorn antelope, prairie dogs, coyote and other small mammals as well as a variety of birds including golden eagles. Wild (feral) horses can be seen in the South Unit and longhorn steers in the North Unit. Visiting park visitor centers with museum and orientation films; visiting the Maltese Cross Cabin near the Medora Visitor Center; joining a guided talk or walk or attending evening program; driving scenic park roads; wildlife viewing; bird watching; hiking; and camping are also fun activities to help you enjoy your visit to Theodore Roosevelt National Park. All roads in Theodore Roosevelt National Park are open to cyclists. The park roads follow the contours of the badlands allowing riders to enjoy the park close up. Off-road cycling is not allowed in the park. All bicycles must remain on paved or dirt roads. Bicylists should exercise caution as they ride in the park; they will share the narrow roads with large RVs and other vehicles. Traffic is heaviest in June, July and August and Road shoulders are absent in some places. Bicyclists must obey all traffic laws. Theodore Roosevelt National Park has campgrounds in the South Unit and North Unit. Commerical Tour Fees: Bus (26+ capacity) – $150.00, small bus (16-25 capacity) – $60.00, Van (7-15 capacity) – $50.00, Sedan (1-6 passengers) – $25.00 + $5.00 per person. None available within the park; a variety of restaurants and grocery stores are available near the park or within a short drive. There are many hikes in the South Unit and in the North Unit. Theodore Roosevelt National Park is open to horse use. Visitors may bring their own horses or take rides with the park concessioner. The current trail ride operator in the park is Peaceful Valley Ranch/Shadow Country Outfitters. For more information on concessioner trail rides, contact them directly at: 701-623-4568. Persons wishing to camp overnight in the backcountry must register and obtain a free backcountry use permit – entrance fees still apply. Pets must be confined, tied or on a leash at all times. Pets are not permitted in the backcountry, including all park trails. A full compliment of regularly scheduled programs including talks, evening campfire presentations, nature walks and long hikes are offered June – mid-September. Guided tours of Theodore Roosevelt’s Maltese Cross Cabin in summer; self-guided during winter. Ski tours in winter may be offered if snow conditions permit. Educational programs for schools and groups may be scheduled throughout the year. The badlands of North Dakota receives about 30 inches of snow a year. Snow can arrive in October and stay until April. The wind tends to blow the snow around quite a bit, leaving some areas bare and others drifted high. The park does not groom any trails for cross-country skiing. Skiers blaze their own trails through the snow. The best places to cross-country ski are on the frozen Little Missouri River and on closed park roads. Skiing on park trails can be somewhat difficult. The trails are narrow and many cross creek bottoms. These creek bottoms are like little canyons and may be too steep for safe skiing. They, and all coulees and draws, may also fill up with blowing snow hiding their true depth. Also be aware of wildlife and keep a safe distance from bison (100 yards minimum). Call the park for information on snow and river conditions. Summers are warm with temperatures in the 80’s and 90’s with a few days into the 100’s. Evenings can be cool. Average maximum: July is 87.1° and August is 86.7°. Average minimum: July 54.5° and August is 52.4°. Annual precipitation is 15 inches. Winters are generally cold. Recommend layers of clothing, especially in spring and fall. Rain gear in spring. Hat for sun protection is needed in summer.